Brewed with Shiso area's natural features and artisans' hearts, this well-renowned sake colors the dinner tables of the local community. I heard that "Suehiro Oimatsu", your model brand of sake, is popular in this area. Kumiko Maeno gives easy to understand explanations. 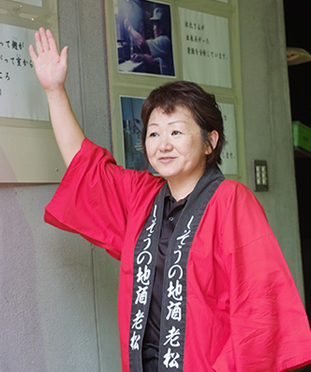 She has guided many customers on tours. 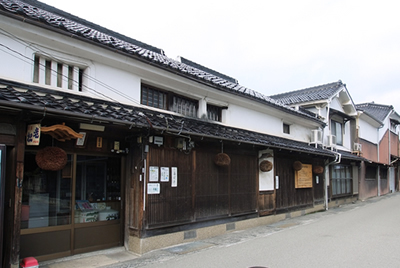 Our sake brewery has close to a 250-year long history. During the middle of the Edo period, in the 5th year of the Meiwa era (1768), the brewery was established in this area, which was the former castle town of the Yamasaki Domain. Henceforth, we have had the pleasure of the residents of Shiso treasuring it as their local sake. For the people of Shiso, "Suehiro Oimatsu" is an absolutely necessary drink at dinner time. It is so well-known that when young elementary school students come here on field trips, they recognize the calligraphy and style of the label and say, "My dad drinks this!". Even if they do drink other brands of sake, it seems that they always come back to Suehiro Oimatsu, and I am pleased that this product has become that essential to the local Shiso dining culture. What do you pay the most attention to during sake brewing? brewed into the sake loved by the local people. The Shiso area is in a basin surrounded by mountains, and is a place that reaps a plentiful crop of rice suitable for sake brewing. 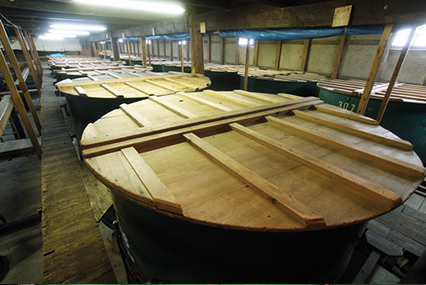 Our Tanba Toji (a chief sake brewer) use full-bodied, delicious underground water for the long-term, low temperature, fermentation process. We do not use any machinery, so the process is done exactly like it was long ago. Experience and a sense for controlling the temperature of the koji (Aspergillus Oryzae) is everything. As a sake brewer, the passion of our toji (chief sake brewers) has evoked my deep trust in them. It is not at all glamorous but, while brewing, we are hoping that one taste of our sake will touch the drinker's heart. We also particular about the ingredients, we only use the two best brewer's rice for our sake: Hyogo prefecture's Yumenishiki and Yamaguchi prefecture's Nihonbare. I think that this brewer's rice suits the natural features of Shiso and the Oimatsu sake brewery. It is interesting, but the sake lees left over from production are also popular, so much so that regular customers have reserved orders of them. I think that this might be evidence that we are using delicious ingredients. Recently, it seems that "Koshu ZenJiro" has been receiving some attention? fans of Japanese sake with the utmost importance. This product was developed for the 240th anniversary of the brewery. "Zenjiro" is a name that has been passed down to every successor, from the 4th generation through the 8th generation. Currently, I do not go by this name but, because of the occasion, gave the name to the anniversary sake. It is a well-cured sake, stored for 5-years, that has a beautiful amber color and, like white wine and brandy, is brewed for a well-bodied flavor. Suehiro Oimatsu is a sake that is deeply rooted in the local community and has a wide-range of uses but this sake, Zenjiro, pairs well with western food; I would also recommend it for splendid parties and other events. There are also many people who give it as a gift. "Zenjiro" is a name that represents Oimatsu but, actually, it is not just the sake. In hopes that it would contribute to the disaster relief fund for the Heisei 21 (2009) typhoon disaster in this area, with the cooperation of local kokeshi doll artisans, we created "Fukko Kokeshi Zenjiro". It is a popular product, known for its cute appearance and use of local Shiso Japanese cypress. The support and love from the local community has allowed us to continue making sake for this long, and so we have very strong feelings for our home region. This means that your sake brewery is one that is closely connected to the community? much to the delight of the Japanese sake fans. Every year, during the Golden Week holidays, we hold an event called "Open Brewery" and the local community, as well as fans of sake, have open access to the brewery. We have a lively time with brewery tours, sake-tasting, selling sake, and so on. We give tours of the brewery, reference room, and talk about the sake brewing process and the brewery's history. Everyone looks forward to it each year, and so holding this event is worthwhile for us. 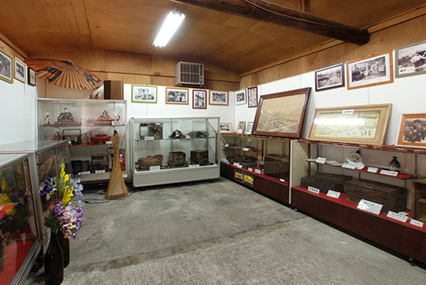 The reference room, in particular, is a point of interest for fans of sake because of the many rare tools we have that were used years ago during the sake brewing process. 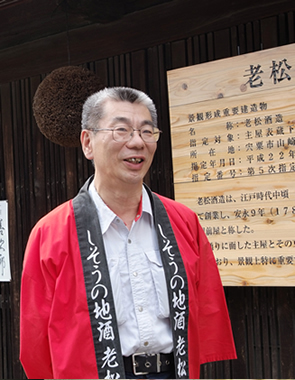 While continuing to have the local community treasure Oimatsu sake, I think it would be interesting if we could create a new product together. There is a rich also among the acidity and refreshing. And to cherish the taste of its founding, and taste of local many years, has been loved by Shiso region. Recommended after cooling it is pure alcoholic drink that has not been pasteurized, to drink cold lock. Hot summer, it is recommended to sleepless nights. Dish of limited quantity built to commemorate the 240-year history. Mellow sake aging amber aged five years in the elephant taste that hark back to the brandy and white wine. From October to January, you can see only from outside.